The case was brought by 36 Republican legislators who voted against Brewer’s plan. Goldwater Institute Attorney Christina Sandefur, who represents the lawmakers, said they will appeal the ruling. Brewer’s plan, which the Legislature passed in 2013, expanded Medicaid coverage to include anyone earning up to 133 percent of the federal poverty level. Under the Affordable Care Act, the federal government pays up to 90 percent of the cost for at least three years to states that expanded their Medicaid programs. The hospital assessment was included to pay for Arizona’s share of the cost. The expansion has provided coverage for about 280,000 new childless adults since it went into effect at the beginning of 2014. Sandefur argued in court that the assessment is actually a tax because it is not voluntary, the proceeds are redistributed by the state and it is not tied to any benefit received in return by the hospitals that pay it. She said not every hospital that pays the assessment treats Medicaid patients, and that those hospitals would not benefit from the expansion. But Gerlach said Sandefur’s argument that an assessment or fee must be voluntary has been rejected in previous cases. Furthermore, he noted that the hospital assessment is transaction-based because the amount paid by each hospital is determined by its number of discharged patients. And the fact that the assessment is imposed by an agency head – in this case, the director of the Arizona Health Care Cost Containment System – instead of the Legislature, which only authorized the authority to impose it, lends itself to the notion that it is not a tax. The judge also disputed the idea that hospitals have not benefited. “Arizona hospitals have benefited financially because they have experienced a decline in the amount of uncompensated health care that they provide to persons who require medical attention but have no health insurance,” Gerlach wrote. Gerlach also rejected the argument that the exemption in Proposition 108 didn’t apply to the assessment. The exemption states that an administratively set fee that is “authorized by statute” doesnot require a two-thirds vote, which Sandefur said meant that the authority must have been previously authorized by the Legislature, such as the Board of Regents’ continuing authority to raise university tuition. Attorney Douglas Northup, who represents AHCCCS Director Tom Betlach, argued the exemption clearly applies to the assessment. Sandefur said that interpretation would open a major loophole in the provision. But Gerlach said in his ruling that the plain language of the provision must be read to mean that the authority must be authorized by “a statute,” not “some other” previously enacted statute. That means that HB2010 would qualify as the statute that authorized the AHCCCS director’s ability to impose the assessment. The judge said Sandefur essentially asked the court to read words that are not actually in Proposition 108’s Section 22, which he said “invites outcries about the judicial usurpation of legislative authority.” He noted that history is full of laws that had unwritten effects or consequences, essentially ruling that, if there is a loophole, it was baked into Proposition 108. “If, as written, section 22 leaves open the door for legislation that plaintiffs disapprove, it is not the court’s duty to recraft that section under the pretense of interpretation in a way that comports with their view of what is appropriate. Indeed, it is the court’s duty not to do so,” Gerlach wrote. “HB 2010 satisfies those three requirements,’’ the judge wrote. Sandefur told the Arizona Capitol Times that she was disappointed with the ruling but wasn’t surprised. “This ruling has some really unfortunate long-term consequences for Prop. 108. I think that it creates an exception that swallows the rule because it really does allow for a bare majority of legislators to get around Prop. 108,” she said. Whether the ruling will have any impact on an appeal is impossible to determine. Gerlach himself said during oral arguments in the case last month that the Court of Appeals would likely pay little attention to his ruling, which he said would ultimately have the importance of the outcome of a Spring Training game. The 36 lawmakers also lost in Superior Court during the first phase of the case, in which Brewer and AHCCCS challenged their standing to sue. 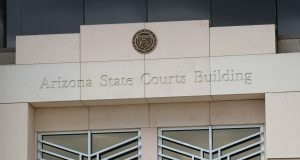 The Court of Appeals overturned the ruling and the Arizona Supreme Court ultimately decided that they indeed did have standing to bring the lawsuit. Nonetheless, supporters of Medicaid expansion rejoiced at the news. In a press statement, Brewer, who left office in January, said Gerlach made the right decision. “This initial decision is a huge win for businesses, our health care system and for hard working families in Arizona. While I expect the lower court ruling to be appealed, I am hopeful that we will be victorious in the end and that the appellate courts will uphold the Superior Court ruling,” Brewer said.